▪ Does not affect hair. ▪ Delivered perfectly smooth hair structure. ▪ Gently cleanses and has a moisturizing effect. ▪ KeraShield Complex - moisturizes and adds strength hair fibers. ▪ Oil from brazil nuts, Tucuma butter - provides protection to the hair for up to three days. For all hair types. 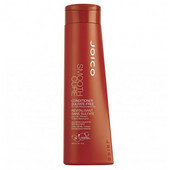 Ideal for curly, unruly and damaged hair. Apply to wet hair after shampooing and leave.